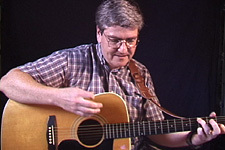 I'll be doing the feature performance at the Sandywoods Center for the Arts in Tiverton, RI, on Tuesday, April 25 at the open mic hosted by Gary Fish. My 40-minute set starts at 8pm (doors open at 7). No cover, BYOB/BYOF (pass the hat). And here's a new song I'll be doing that I wrote for the Rhode Island Songwriters Association (RISA) Songwriters in the Round. It's called (Time to) Face Facts, And it doesn't even invoke Kellyanne Conway (until the fourth verse...) Enjoy! 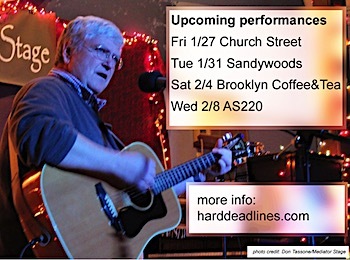 Here's the details on my upcoming gigs in Warren, Tiverton, and Providence. I'll be playing a set of original folk tunes (and at AS220, a brand new song written for the occasion!) There's a venue for every part of the state and schedule — both weekinights and weekends. Hope to see you there! Thanks to Don Tassone of Mediator Stage for the photo! 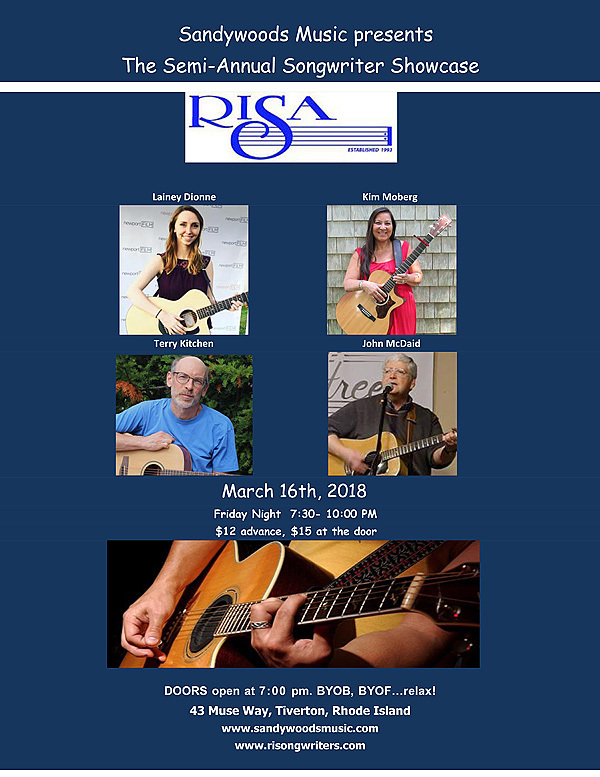 RI Songwriters Association. Doors open at 7pm and four singer-songwriters each perform three songs, with the second one written in the last month on the theme "Time to face facts"
Monday night from 6-8pm I'll be busking on Bowen's Wharf as part of the Newport BridgeFest, the week-long celebration of local musicians that "bridges" the Folk and Jazz Festivals. 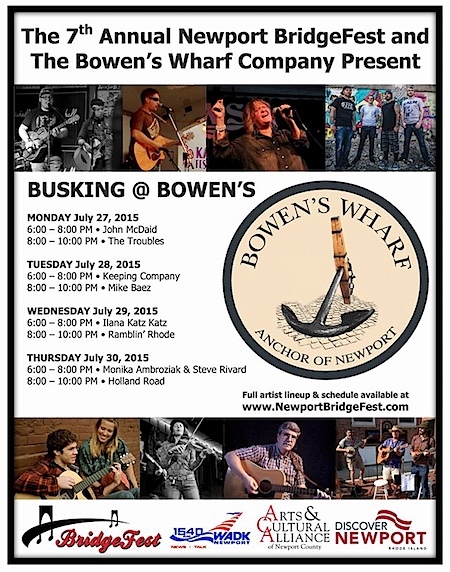 More than 50 local musicians will be playing at nine venues around Newport next week — you can get the schedule and full details at NewportBridgeFest.com. Hope you can drop on by! They are currently one of twelve semifinalists in the Northeast region and to make it to the finals they need to receive the top two highest votes in the region. Becoming finalists would send them to Anaheim, California in January to compete for prizes and gain valuable exposure. Additionally you will automatically be entered to win $1000 each time you vote. Tell everyone you know to sign up and vote every day, as the finalists are determined solely on number of votes. The finalists will be announced on Dec 1, 2010 and we would be so proud to see Portsmouth's own Scarlet on the list! If you haven't already checked out Scarlet, you can download their 5-track EP for FREE at http://scarlet.bandcamp.com/ and keep up with them on www.myspace.com/scarletri. Hey all you Patriots, vote early, vote often! Disclaimer: Written substantially from a listserv message. American Songbook at Trinity Church. Trinity Church's Ministry of the Arts presents their 4th annual event in the "American Songbook" series, this time, saluting "The Chairman of the Board", a.k.a. "Old Blue Eyes" - Frank Sinatra. This all-Sinatra review, under the direction of Paul Allard, and musical direction by Al Deston, III, spans the artist's 60+ year career, during which he recorded over 2,000 songs. Enjoy a trip down memory lane with the Trinity Church Ministry of the Arts cast, and sing along, tap your toes, or just watch, listen, and enjoy the show. The show features Portsmouth musicians Diane, Chris, and Jonathan Myers, as well as Paul Allard, Lynne Ceglie (so sorry about Tuesday, Lynne! ), Paul Koumrian, Pro Lyon, Carol Parfet, Steve Parfet, Nancy Roy, Bob Smith, and Cathy Taitz. Each installment of "American Songbook" has been presented to raise money for a particular charity, and this time is no different: Proceeds from this year's show will benefit "Grace's Children Orphanage" in Northern Kenya. Tickets are $20. For reservations, please email trinity.newport.arts@gmail.com, or call 401-324-9492. Disclaimer: Written substantially from a press release. Folk or filk, you decide. Read about and download tunes, or check out some of the lyrics.